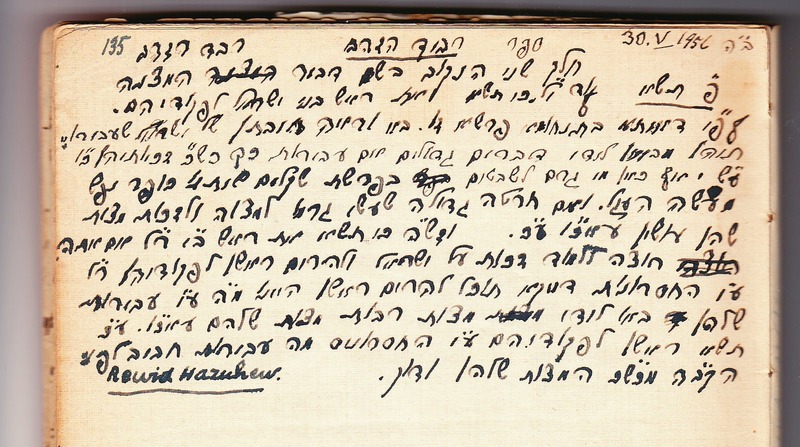 A " Segulah"( a mystical incantation or action) against the evil eye,"Eina Bisha," from the notebook of grandfather Shmuel Weinberg, a devout and pious Jew, who sent his sons to the "gymnasia", an act of heresy in that region and time. 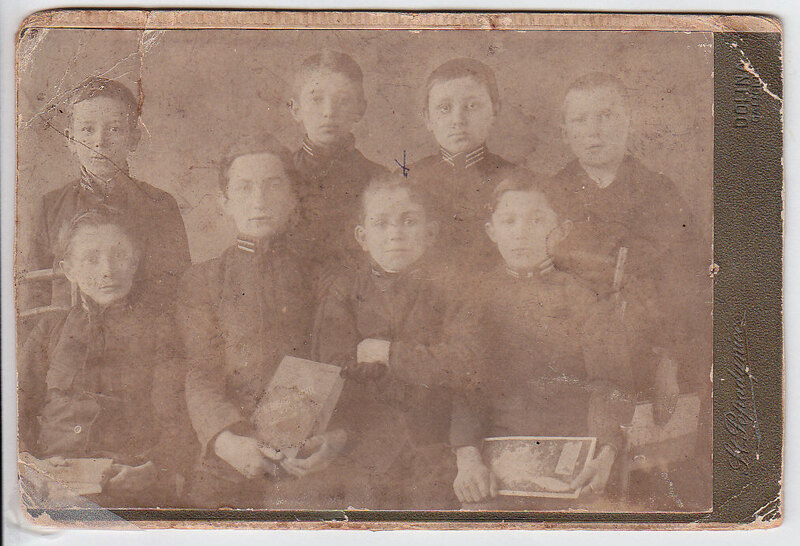 Class picture from "Gymnasia"( high school) in Dolina. 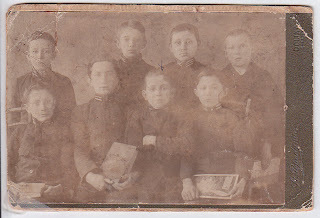 If this is the entering class, at 7th grade in the American system, my father, second from right on the top, would have been 12, which would put date this picture as 1913, a year befroe the outbreak of World War I.
William Weinberg, age 12,in the gymnasia uniform which angered his neighboring Hasidim because it was an emblem of the assimilated Jew. Galicia, Austro-Hungarian Empire. 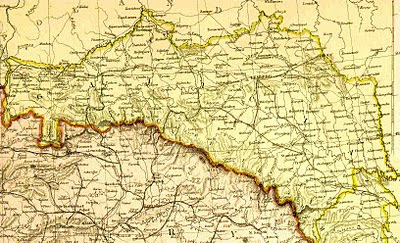 Dolina(Dolyna)is situated due north of Sighet, Hungary,just below the 49th parallel, due west of Stanislawow( Ivano-Frankivsk), due south of Bolechow ( Bolekhiv), further north to Lemberg(Lwow,Lviv). 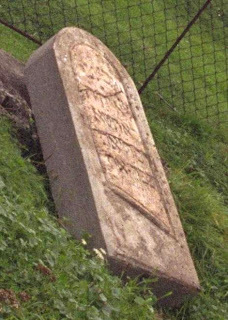 Ten Commandments, all that is left of the synagogue, found in the cemetery. 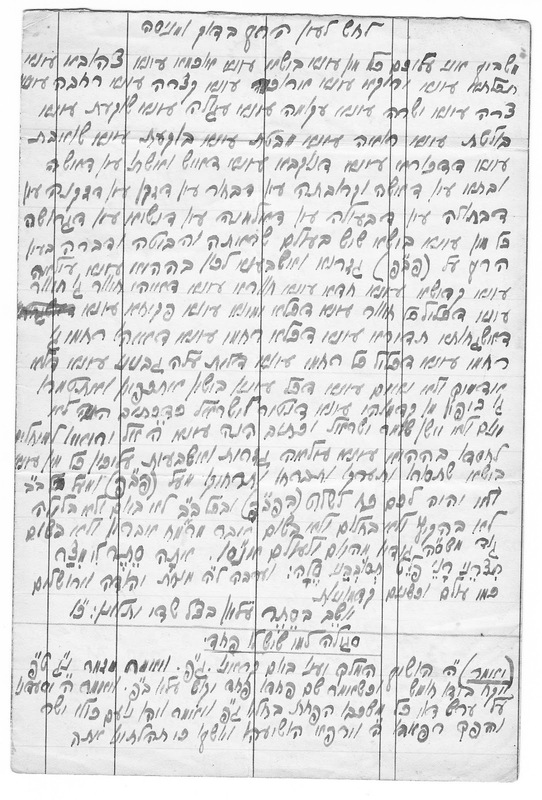 In light of the custom of Jews to give names after the deceased ancestors, perhaps my uncle was named after his great- grandfather at the request of Binah. 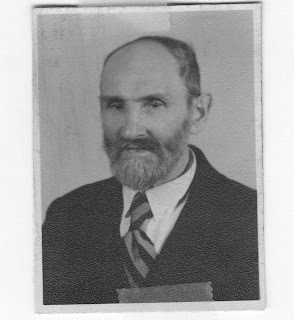 I can’t determine who my father is to have been named after; William, the anglicized form of Wilhelm, is a common Jewish counterpart to the German/Yiddish “Wulf”( wolf), in Hebrew, Zeev. 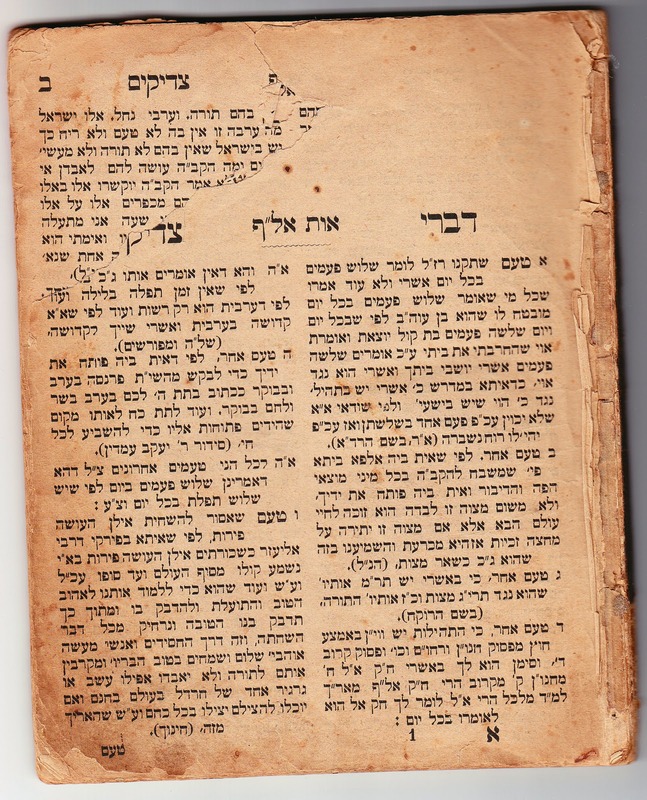 When Jacob blesses his sons, he describes the youngest, “ Benyamin Zeev Toref”, Benjamin is a ferocious wolf. Perhaps my grandfather had that verse in mind when he picked “Zeev” as my father’s Hebrew name. It was a blessing in disguise, as symbolically, the two brothers, as a team, were able to over come great danger. Little could my grandfather imagine. There is the idealized world of the Shtetl, all of humor and the levity of a Sholom Aleichem and a Fiddler on the Roof, and then there is the fantasists Shtetl, of an IB Singer. And then again, there is the shtetl. 1 B The shtetl of Dolyna and the origins of the Weinbergs. 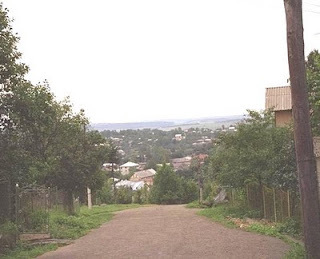 The shtetl of Dolyna and the origins of the Weinbergs. 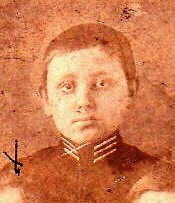 The Jews of Dolyna ( also spelled Dolina) trace their origins back to the times of the Polish kings who had conquered Ukrainian territories. My uncle, Benjamin (Munio) who travelled back and forth in the former territories of the Austro-Hungarian Empire, as a lawyer, found ancient records in the town’s archives. 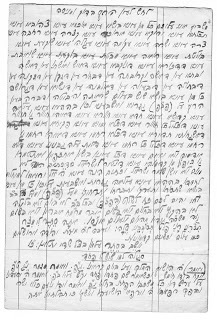 He reported having found documents dating to the 16th Century, when a progenitor of the Weinberg family ( with name registered as Turteltaub) came from Turkish held regions to Dolyna. 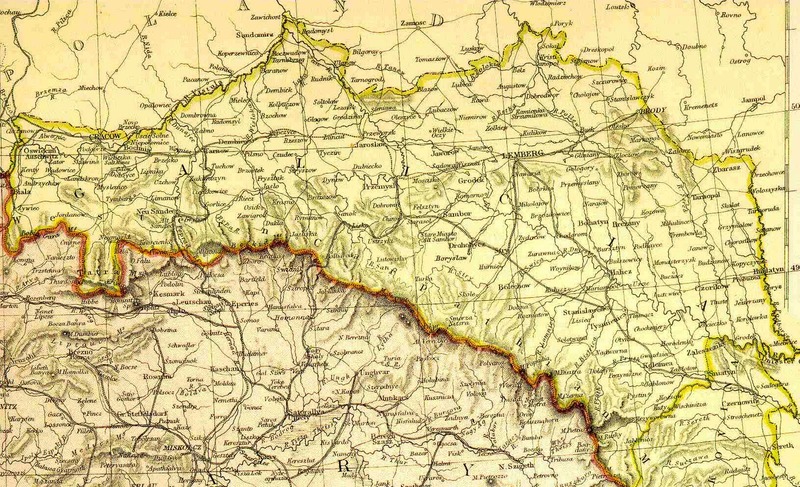 During the time of massacre of Jews in the Ukrainian territories of Poland by the Cossacks in 1648, the borders of the Ottoman empire came just north of the town of Dolyna. These regions were spared the massacres and Sefardic Jews came as administrators or merchants into those territories. (Presumably, Turtletaub is a later “Yiddishization” of what may have originally have been a Sefardic/Spanish name, perhaps akin to “ Paloma” or “ Tortola). This first ancestor of record established the Jewish cemetery and built a house there, which was still in use at least till 1917, and the family members were always given the choicest burial plots. He opened and operated salt mines under contract from local aristocrat. By the 17th century, the first “Weinberg” was registered in the Grundbuch, land registry, of Dolyna in Latin, German, and Polish. 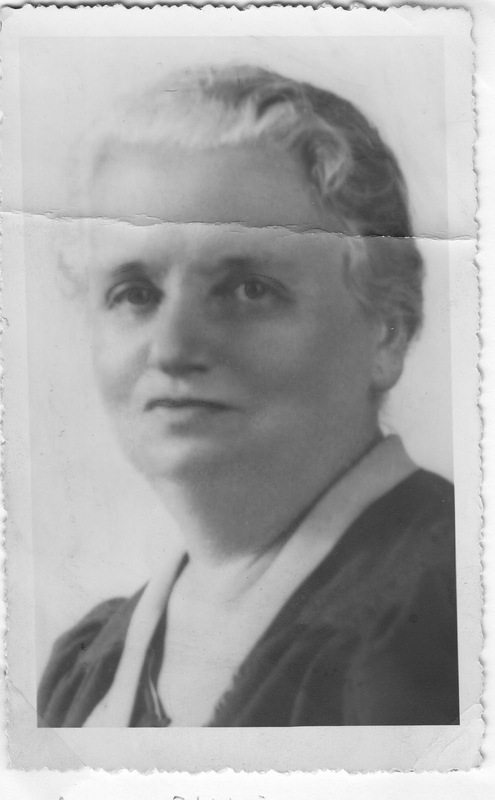 (Note: This Dolyna/Dolina is not to be confused with a current Dolina, which was formerly called Janow). 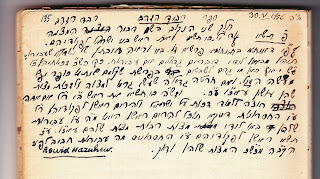 Conscious Jewish historic memory begins with Abraham and Gods first words ”Lech Lecha.”-Go, an emphatic go, get yourself out of your country, from your kindred, and from your father’s home,” Movement, whether by act of God or by human brute force, has been a hallmark of Jewish existence. Two millennia ago, some Jews made their way into the Italian peninsula, some as merchants, some as prisoners in the course of the two great rebellions against the Roman Empire, while others made their way to the Iberian peninsula. Among them where the progenitors of my family. It has been estimated that no more than 3000 families comprised the core of this dynamic Jewish community spred between what has become France and Germany. “ Lech Lecha”—this is what they were told, again, this time by rioting Crusaders or rapacious kings eager to seize hold of Jewish properties. My father , the late Rabbi William Weinberg, came to Clarksburg, West Virginia in 1963 and served as Rabbi of Etz Chaim Congregation till 1969. Here was a worldly-wise man who had lived in Vienna, Berlin, Frankfurt, New York, and lastly, Washington, D.C. What could possibly satisfy him in a small town of at best 28,000 population at that time. 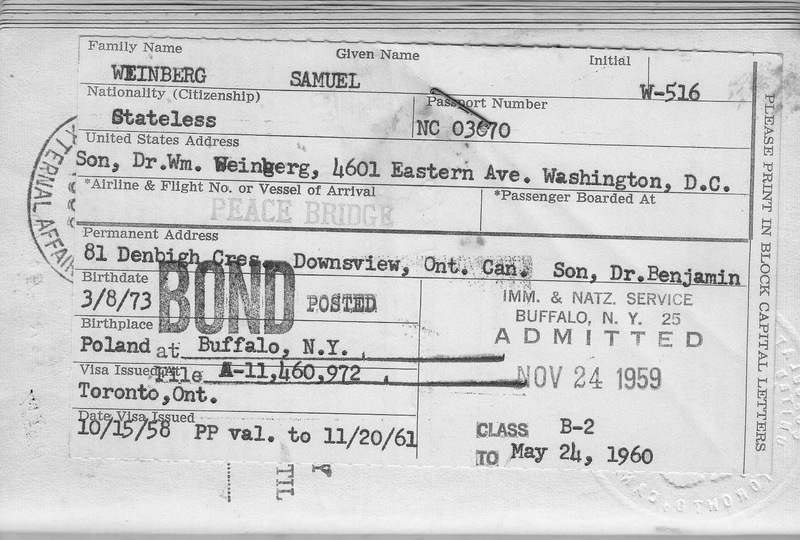 It was a long 12 hour drive over a winding highway to his previous home, Washington, and a 4 to 5 hour drive, also over twisted terrain, to the nearest major Jewish community, Pittsburgh, PA. When I was a student at New York University, my dorm-mates were perplexed by this town they had never heard of, except, almost, in a song by the TV-series rock group, The Monkeys, “ Take the Last Train to Clarksville”( but “ville” , not “burg”). Finally, they were satisfied that indeed, such a place existed, because, on one of the last episodes of “ The Fugitive”, the hero escape through a tunnel, which, he is told, will take him into Clarksburg. Nevertheless, he said, in a thought that presaged the universality of communications of the iphone and wi-fi era, nothing is distant anymore—all the benefits of sophisticated society could be found through movies and television and a good record could substitute for a symphony orchestra. A man who had survived Nazi prisons, concentration camp, and exile in the farthest reaches of the Soviet Union could make his home anywhere. In truth, this town, despite its size and geographic isolation had its own element of sophistication. It was the birthplace of noted Civil War General Stonewall Jackson (one of the members of the Jewish community , S. Joseph Birshtein, was himself an authority on Jackson). The graduates of my high school, Washington Irving, went on to significant universities; a small neighboring college, Salem, had moved its center to Clarksburg and was drawing students to it from New York City. There was a local amateur theater company and cultural events of its own. 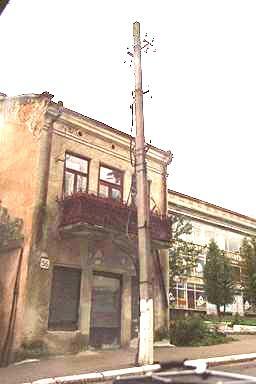 It also had a Jewish community which supported the Etz Chaim Congregation ( recently disbanded, however). They were key players in the civil society. There were two rival pharmacy and general supplies stores along Main Street. The stores constantly advertised promotions to draw customers one form the other. What was not known was that both stores belonged to the Gottlieb family. This played to the benefit of the other local merchants despite what may have seemed unfair competition. One year, a discount store, in the style of a Kmart or Target, first opened in the outskirts of town, offering a huge selection, deep discounts, and ,above all else, easy parking. This was devastating to the local business—here was a one-stop shop all location, so close, why shop locally. This did not phase the Gottliebs- they simply upped the ante, began an even more intensive rivalry between their two stores, the local customers stayed in town to catch their bargains, and , on their way in and out, shopped at the other local merchants. Business stayed in town. Another successful local Jewish business was the Workingman’s Store, a men’s clothier that carried both work clothes, as the name indicated, as well as a line of dress suits. The founder, Berman, was in his 80’s when he went to visit Israel and climbed the long ascent to Masada, to that date, the oldest man to have made the climb since Josephus time. ( I did the ascent myself when I was 20, and it left me breathing hard. A cable car has since made that ascent easier and no longer a challenge). Jews from distant towns made their way to Clarksburg for Jewish education for their children. One such family would come in every Sunday from Elkins, at least an hours drive in winding roads, where they had a lumber mill. No big crime here. The president,Mr. Weiner, who ran a successful scrap metal business, had come as a poor immigrant from Lithuania, and started in the West Virginia towns as an itinerant peddler, a fine tradition started by the likes of the founders of Macy’s. At the same time, this Jewish resident of Elkins served as the mayor, sheriff, judge, clerk all rolled in one. The peddler came to town and it turned out, the town had a rule against wandering peddlers. He had to cool his heels overnight in the local clinker . Many years later, this pillar of the Jewish community, and a generous philanthropist, would preside at the service of his jailor’s grandson. Jewish life for a teenager consisted of the local AZA-BBG, the Bnai Brith Youth affiliate, with at most a minyan of members. Obviously, one of the greatest worries for their parents was interdating—with such a small pool to chose from, young Jews didn’t easily date each other—they had grown up together, afterall, and were too close. The big event of Jewish life for the teens, therefore, consisted of pilgrimages to our fellow teenagers in Uniontown, McKeesport, or the great Mecca for us, Pittsburgh, a good four hour drive over winding road. Occasionally, our counterparts would make the trek to Clarksburg in return. Here was the chance to find partners that were within the pale of acceptability. There was never a problem to get a good turnout for services on a Friday evening or Saturday morning, but Shabbat Minhah( afternoon) was a different story. One way to guarantee the tenth man was to pay the congregation’s teenagers for their attendance. This worked well for a while, until, it was told, the teenagers began to organize, demanded a raise, and went on strike. The congregation, in turn, was not intimidated, and fired the strikers. They got the minyan without the hired help. 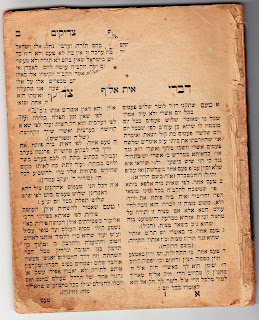 There was another method for getting the minyan. Across the street from the synagogue was a lodge, I believe it was the Elks, and it held a club card inside. Whenever they were ready for the tenth man, they would call the lodge and the manager would send one of his Jewish members across the street to join the services. The teenagers, too, who had now been drafted into minyan service without pay, after the failed strike, had their own “lodge”. Next door to the synagogue was the Masonic Temple, which had a youth affiliate, DeMolay, with it’s own club room, featuring a pool table. Here it was that the Jewish youngsters would hang out, waiting for the minyan to start, and it was here that I learned my best shots. 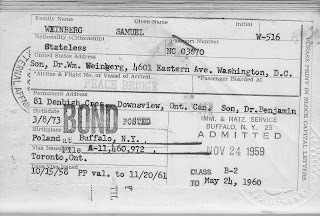 One time, my father asked the president, the same peddler turned philanthropist, why he didn’t bring his elderly mother, who was in New York, to live with him in Clarksburg. After all, it would be no problem for him to hire caretakers for her, and this way, she could enjoy being with her family every day. But Rabbi,, as you know, when the Moshiach will come, he will raise up the dead and bring them all to Eretz Yisroel. My mother is worried- the Moshiach will never find Clarksburg! All Jewish thought begins with a question. Here is my question. Why write about one family? After all, there are 6 billion plus individuals, surely at least a billion families. Why write about Jews, who numerically are a statistical margin of error in a population census. The Micro sheds light on the macro. One Jewish family highlights the story of the Jews and the Jews highlight the story of the human family. As the adage goes, Jews are like everyone else, only more so.